This is the first of a series of planned articles commemorating the May, 1974 release of the seminal Sparks album Kimono My House. 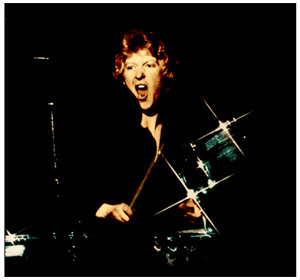 Kimono was the first of three Sparks albums to feature the great drummer Norman "Dinky" Diamond, the subject of this article. Kimono My House put Sparks on the map. The two albums that followed, also considered classics, are Propaganda (1974), and Indiscreet (1975). On these albums, Dinky Diamond made an indelible contribution to Sparks history. He brought originality and an innate sense of how to incorporate the drums into the complex arrangements of Sparks' principal songwriter, Ron Mael - not an easy task. As I discuss below, Dinky Diamond went far to set the template for Sparks drumming. Diamond, who was voted Drummer of the Year in a 1975 poll conducted by Premier Drums, tragically took his own life on September 10, 2004. He will be forever remembered by fellow Sparks drummers, by those who contributed to those classic Sparks records and other musical colleagues, and by the fans of his music. Here, in their words, are tributes and thoughts about the great Norman "Dinky" Diamond - including a few additional thoughts of my own at the end. These individuals took time from their busy schedules to make these contributions. Needless to say, I am truly grateful.